As modern Gujarat struggles to find ideas to manage its water resources, it may have uncovered an engineering marvel that helped the Harappan civilization harvest water. A team of geo-technical engineers from IIT-Gandhinagar and an archaeologist from the Archaeological Survey of India have been scanning an area of around 12,276 square metres in Dholavira for over a year using Ground Penetrating Radar. The team may have discovered a Harappan water-harvesting system. The structures is buried 2.5 metres beneath the ground and located along Manhar river in Khadirbet in Bhachau taluka of Kutch district. This Indus Valley Harappan city flourished from about 3000 BCE to 1700 BCE. The city is sloped westwards, with 48 hectares under fortification and spread over 100 hectares. The invisible radar signals bouncing off underground structures have revealed an intricate system of interconnected water reservoirs, bunds, channels, drains, and checkdams. 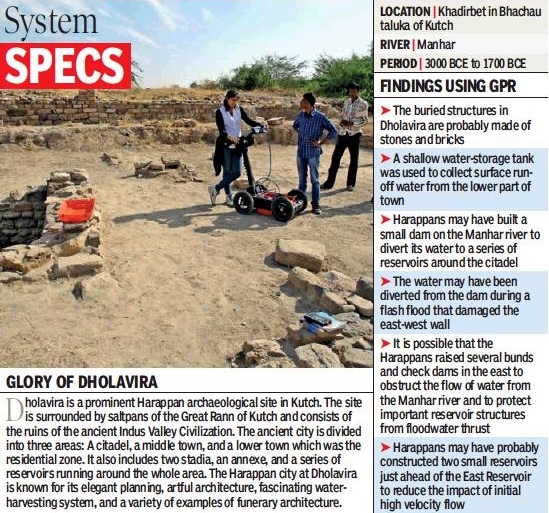 The system, the experts surmise, was used for diverting waters from the Manhar river to the eastern reservoir at Dholavira’s Harappan site. Prashant said the other theory was that the Harappans also knew how to control the floodwater thrust by building a system of checkdams along the river, oriented in such a way that it caused minimal damage. “And specially designed water channels reduced the velocity of water before it drained into the main eastern reservoir,” Prashant said. He said that the GPR method can help reduce both costs and time involved in such massive excavation operation because it can pinpoint the exact area and depth of excavation.